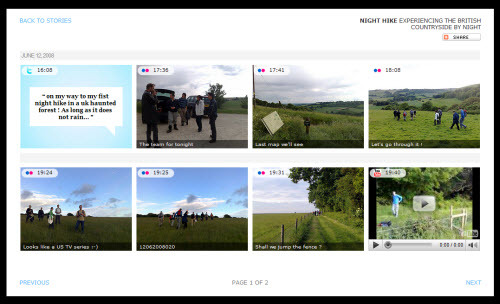 Storytlr is a new service that focuses on lifestreaming with an added story telling angle. But it offers quite a bit more than just that niche based feature addition. It actually offers much more as I’ll cover shortly. The service was created by created by Laurent Eschenauer who told me that this is a personal project built with friend Alard Weisscher in their spare time. You would never know that after spending time on the site as it offers as clean and polished an experience as you will find on most of the top services. Setting up an account begins like any other Lifestreaming service by adding your accounts from social media sites. 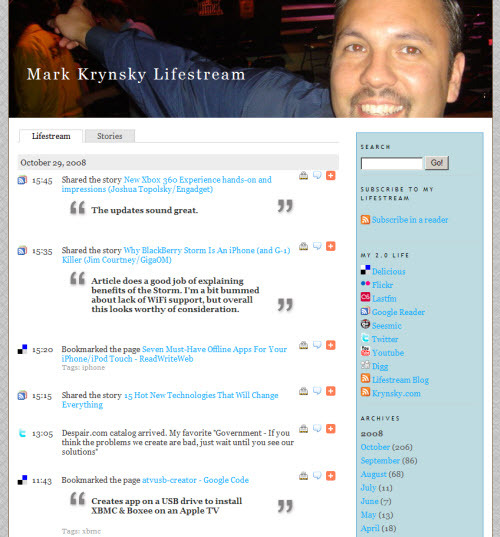 They currently support Delicious, Flickr, Google Reader, Last.fm, Picasa, Qik, Seesmic, Twitter, YouTube, Digg, and the ability to add additional RSS feeds. You also have the ability to manually create posts in the categories of status, blog, link, image and audio, the last two of which are based on uploading the assets to their site. The Storytell feature allows you to convey a single story by aggregating data from Flickr, YouTube, and Twitter based on a specific date range. Once configured, it then creates a custom overlayed media show displaying each of the items as a “boxy” mashup. This offers a nice gallery view that isolates the content by a single experience in a nice visual manner. I tried creating one but didn’t have proper content to adequately create a “story”. In creating mine I didn’t see the ability to flag which items should be part of the story based on the date ranges. I would think this would be necessary as some items that aren’t relevant would more than likely sneak in. The data displayed in the Lifestream offers subtle changes depending on the theme you choose. Each item offers the ability for commenting. Comments are then included as part of the latest comments widget in the sidebar. You also can flag individual items as private. There’s an add this function for every item. The Archive that appears in the sidebar is identical to that in WordPress offering the ability to filter items by month and year. The last feature they offer is one that I’ve been very interested in with regards to Lifestreaming data. It’s the ablity to provide backups. The current implementation only offers the ability to export data from 10 sources as CSV files, but I like their thinking along these lines. They also state that in the future they will offer the ability to download binary files as well. Overall I’m very impressed with this service especially considering the resources used to create it. It definitely creates a valueable offering for users interested in creating a customized Lifestream with WordPress-like functionality and flexibility. Definitely worth a look and can only get better over time. Thanks Mark for this extensive and positive review of our little project ! You raise a very interesting point with respect to lifestreaming: it makes you change your habits on how you create content. Personaly, I've stopped sharing all my google readers items (too techy, not interesting for my friends) and use the google reader tag feature to share only a subset. When I'm out, I also try to do more twittering /mobile pics/qik movie, not necessarily for real time sharing, but because I know that it will be straightforward to repackage all these different media into a story (after the photo album.. do we move to the multimedia one ?). Finally, I now always take care of adjusting timezones on my digital camera, because we add your flickr/picasa photos in your stream at the time taken and not uploaded. This makes a key difference, and the interweaving of twitter, flickr, qik really start to tell your story, not the online one, the real one. wow, impressed, already signed up and configuring. me, i've got a lot of stories to tell, and was waiting for a tool like this. it might seriously take weeks to develop this fully, but i can already see that it will replace my swurl account. It is being clunky, in that it is not pulling more that 200 items (and I have a lot more than that – about 3300 flickr images!). i assume that is a because the account is fresh. Once that gets worked out, i will be off and running. This is in someways similar to the tripstream you had some coverage of aways back. Adding to the story via mobile is a really powerful feature, of course not just with storytellr. The finegrain control of inclusion and exclusion after the fact allows for, just as the name suggests, storytelling.